Place the mint leaf and most of the strawberries into a meshed sieve. Push the strawberries through the sieve into a bowl using the back of a spoon. (You're not really after the pulp, just the juice.) Chill until you are ready to serve your drinks. 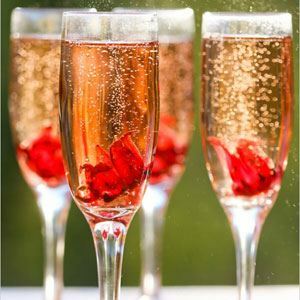 Divide a small amount of the strawberry purée between Champagne flutes, place an extra slice or two of strawberries for decoration either in the bottom or on the rim and carefully fill glasses with bubbly.